Another year, another wedding anniversary. This one makes 18 years! It is fun to reflect back on the years – the good times and bad. 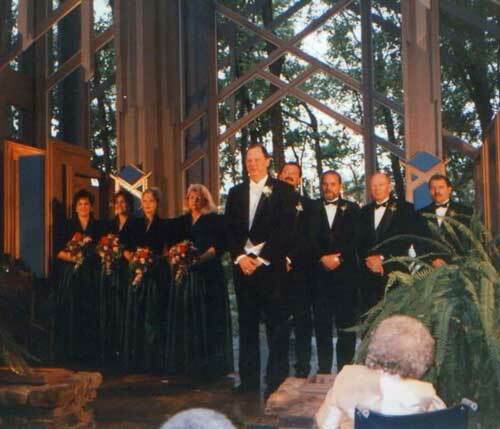 When I look through my wedding album, I enjoy seeing pictures of friends and remembering those that have passed. 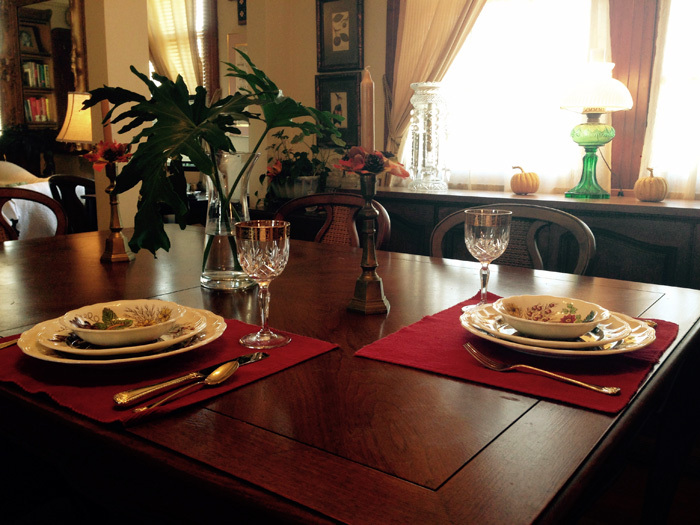 This year, we stayed home and had a quiet dinner together. In a city like New Orleans, there are so many wonderful places to choose from, but we love cooking, and it was quite lovely. 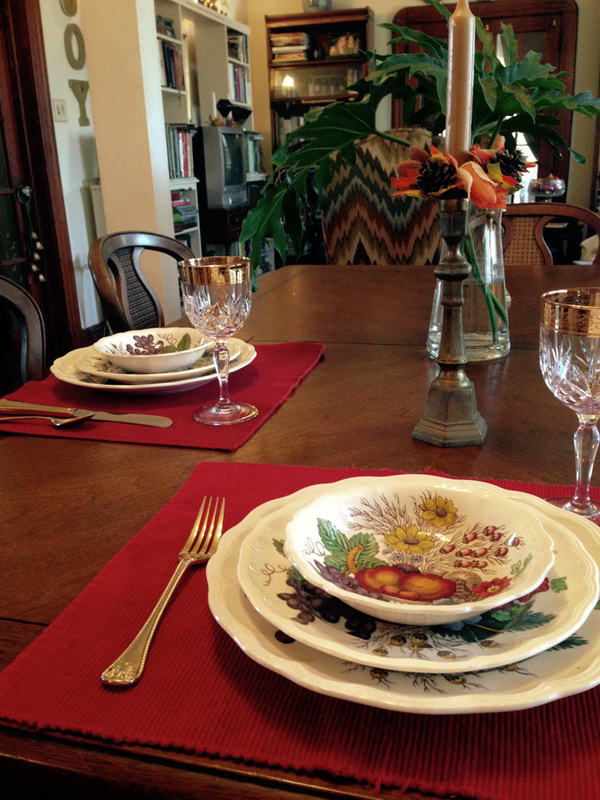 I set the table with my pretty Spode dishes. 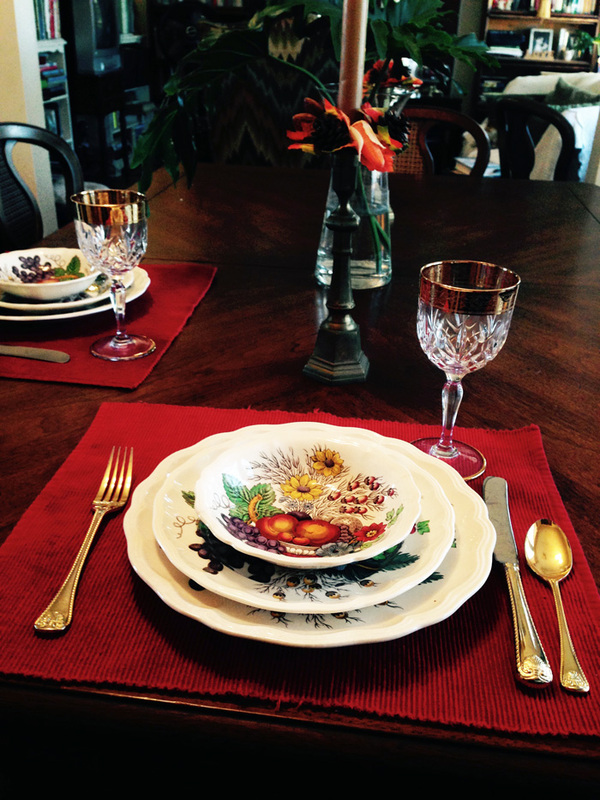 Now that I am writing this, I’m wondering why I didn’t think to use our wedding china! Oh well, I’ll do that soon. Here is a throwback pic of the happy occasion. 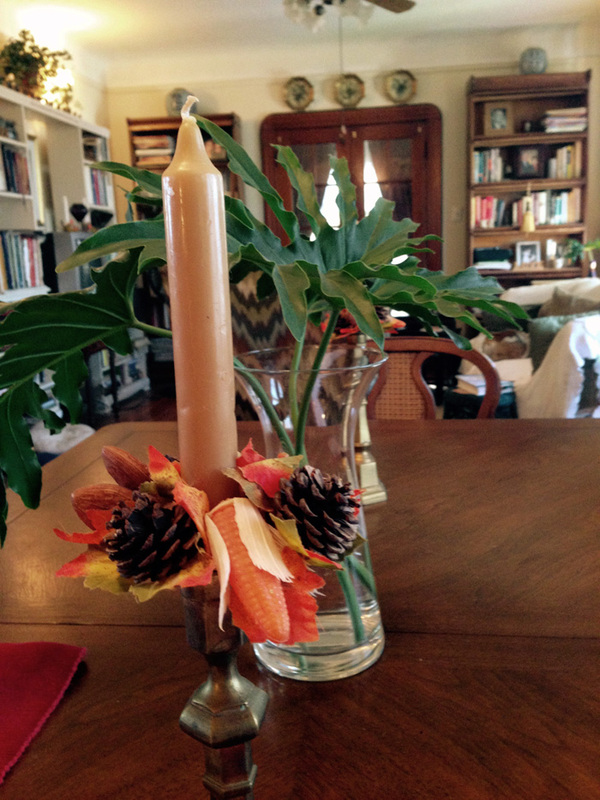 Sharing today with Tablescape Thursday on Between Naps on the Porch. P. S. I love hearing what is going on with you in the comments. Thanks for visiting! Twenty-three years ago, I lost my dad to cancer. He was 54 years old. I’ve been thinking a lot about Daddy lately. I remember when he had his first chemo treatment after he was diagnosed. Everyone else was gone, and he and I had a great visit. We sat on his hospital bed, and he told me what was important to him. He said that the most important thing in his life was his relationship with Jesus Christ. With tears, he expressed his amazement at God’s love. Daddy wasn’t afraid of death because of the assurance he had of salvation through Jesus Christ. Remembering his words and reflecting on them this week has helped me remember to put things in perspective. If I knew that I only had a short time to live (which is a possibility, not just for me, but for everyone), what would my priorities be? I think that Daddy had it right. In the end, you can’t take anything in this life with you. I want to focus on what lasts. His love is what lasts and it is His love that I can share with others. What is important to you? If you only had a short time to live, would it change your priorities? 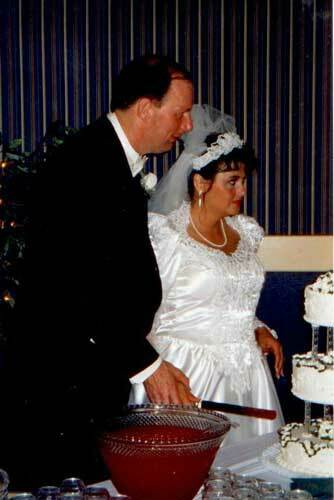 Okay, tomorrow, October 12th is my 13th wedding anniversary. When we were looking for places for the ceremony and reception, of course, I took pictures and after the wedding, then, I had before and after pics! 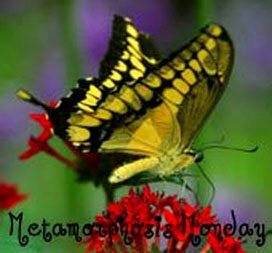 I would love to share some of them with you for the wonderful Monday Metamorphosis hosted by the very talented Susan at Between Naps on the Porch. The picture above was taken months before the wedding. 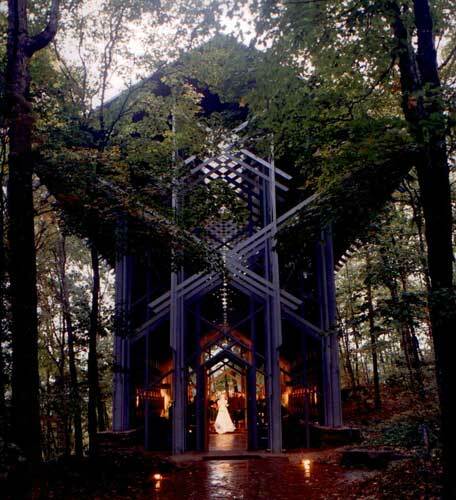 We knew the minute we entered Thorncrown Chapel that this was where we wanted to be married. 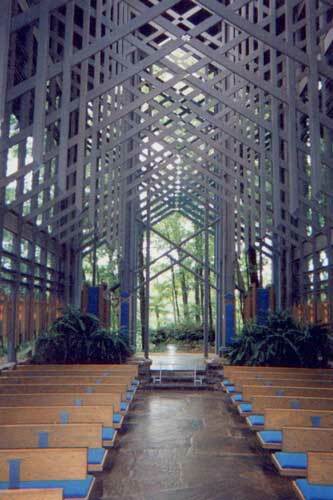 Here is the chapel the night of the wedding. Can you see us there at the alter? The chapel looks very different, although still beautiful with wonderful people in it. 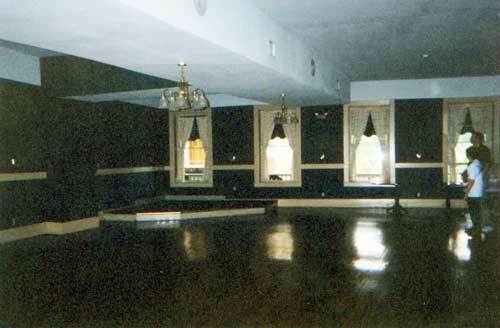 The picture above is of the ballroom at the Basin Park Hotel. Actually, it has been completely redone since then, but this was what it looked like over 12 years ago. 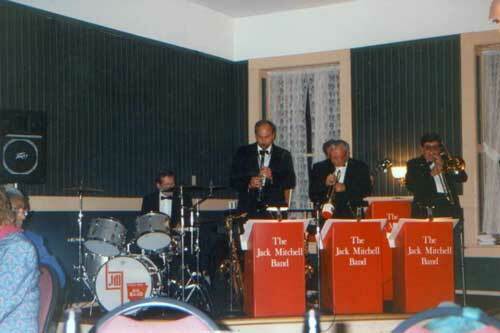 Here is the ballroom with the Jack Mitchell Big Band. They were fabulous. The drummer is Jack Mitchell. They played all Big Band music which we just loved (that is why we chose them, after all). And, of course on the other side was the table with the cakes. There were tables along the side wall with lots of food and lots of yummy champagne and punch were served by the wonderful wait staff. 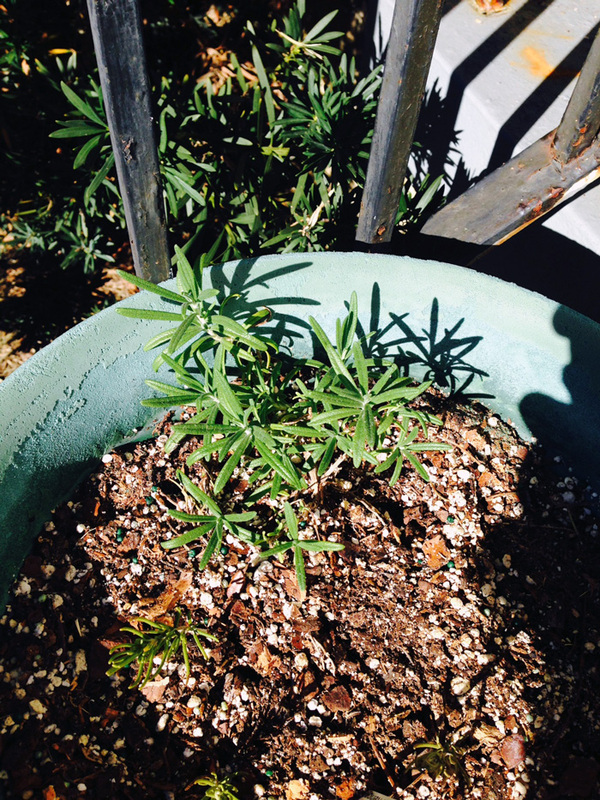 Here is a picture of the mothers. 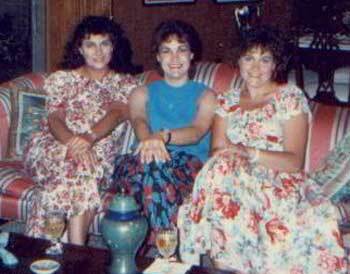 My mother, Carrol, is on the left. 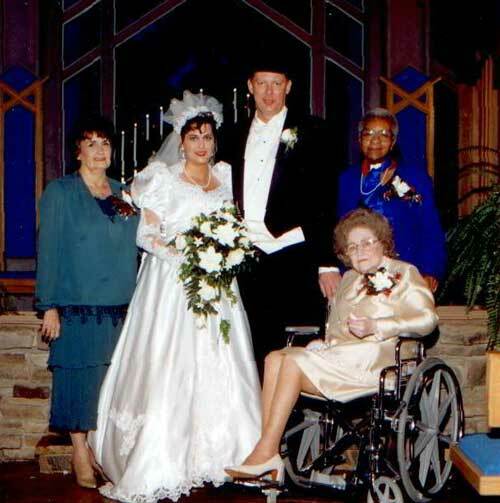 My husband’s mother, Miss Iola, is in the wheelchair and the dear lady who we dubbed an “honorary mother” is Norvelle Turner. 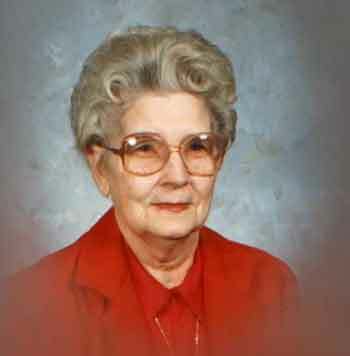 She lived with my husband’s family for nearly 45 years before her death from cancer. She loved my husband like a son; and he her like a mother. His mother died 2 months to the day after her death. 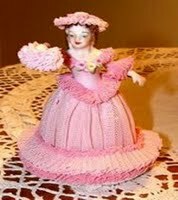 Though Norvelle was Miss Iola’s housekeeper, she was loved like a member of the family, and, in fact, my husband took care of her ’til her dying day. And, here we are, the happy couple then and the happy couple now. 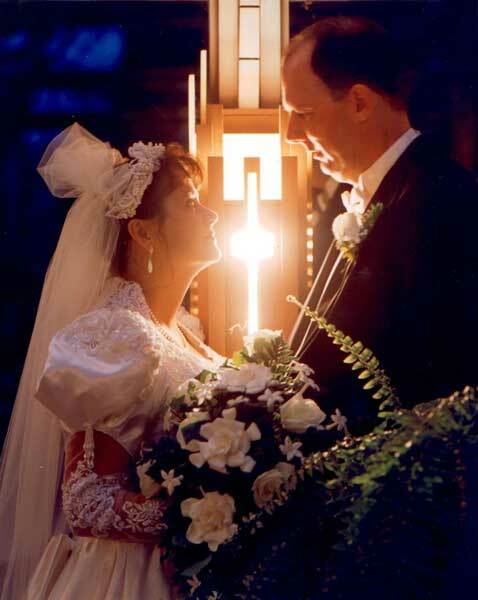 I am very blessed to have married this wonderful, Godly man whom I love even more now, 13 years later. he amongst you and remain with you always. Okay, other than the shrimp, I don’t really remember what was served at my wedding reception. I’m sure I didn’t get around to have anything. We were too busy having the time of our lives! Anyway, there had to have been chocolate. I like this recipe and think it would be great for a wedding reception. Place 1/3 cup morsels in a medium glass bowl, and microwave at HIGH 1 minute or until morsels are almost melted, stirring until smooth. Let cool. Add the cheese to melted morsels, and beat at medium speed of a mixer until smooth. Add 1 (16-ounce) package powdered sugar to cheese mixture; beat until well-blended. Press mixture into a 6-inch square on heavy-duty plastic wrap, and cover with additional plastic wrap. Chill at least 1 hour. Remove top sheet of plastic wrap; cut mixture into 48 squares. Roll each square into a ball, and place on wax paper. Roll half of balls in cocoa; roll remaining balls in 1/4 cup powdered sugar. Place 2 tablespoons morsels in a heavy-duty zip-top plastic bag, and microwave at HIGH 1 minute or until morsels are softened. Knead bag until smooth. Snip a tiny hole in corner of bag; drizzle chocolate over balls rolled in cocoa. Serve at room temperature. Today, I’m participating in the Miracle Makeover Party! Read the details at the bottom of the post and start commenting! Thank you to Guideposts Magazine for bringing us the video of Colette and her miracle makeover. The link to see the video is at the bottom of this post. Colette’s story is inspiring. Many things inspire us in life. Special people, the song of a bird, rainbows, a refreshing breeze – all of these remind us who we are and Whose we are. They remind us of our Creator and our salvation! Praise God From Whom All Blessings Flow! As many of you know, I lost my beloved Grandpa last Friday. He inspires me to live life well and fully. I lost my father in 1992. I’m inspired by him to care about people and to let them know that I care. I am very fortunate to still have my mother. She inspires me to put my heart in to everything I do, whether it is teaching a class, working with clients, making dinner or setting a table – give it your all and do it well. I am also inspired by my husband. He inspires me to be committed and he makes me laugh. I could go on and and on about all the inspiration in my life – sisters, brother, nieces and a nephew, a bonus father and on, and on it goes. Today, I’m inspired by a cool morning after so many hot, hot summer days! What inspires you today? Check out the information below on the wonderful Miracle Makeover Party and join in! Please take the time today to thank Guideposts Magazine for bringing us the video of Colette’s story. Please leave a comment thanking Guideposts Magazine, and telling them what you loved about the video – and be sure to click “Like It”. The comment you leave on each participating site will generate a $1.00 donation by Design Gives Back. These donations will facilitate another Miracle Makeover. 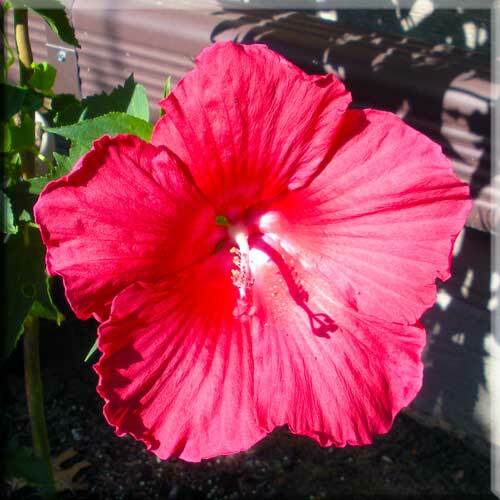 Please comment here on Pink Saturday post for a $1.00 donation. Comment at Spiritual Sunday for another $1.00 donation. Comment at Country Wings in Phoenix for yet another $1.00 donation. And, of course visit Kelee at The Katillac Shack, and comment for yet another $1.00 donation. At Kelee’s you will view the awesome Miracle Makeover video, meet and learn more about Colette, and have the opportunity to see and be eligible to win awesome prizes. And, be certain to post this event to Facebook, and for another $1.00 donation leave a comment at www.facebook.com/guideposts. Be certain to thank Guideposts for sponsoring the video, tell them what you like about the video, and be sure to click “Like It”. Wow, it has been crazy busy around here this past couple of weeks. I thought I would try to get by with combining posts and not actually posting every day. Oops, apparently not a good idea. In addition to my mother and my sister letting me know that they had noticed and missed a new post every day, others have let me know as well. I’ll have to work on my time management to do better! 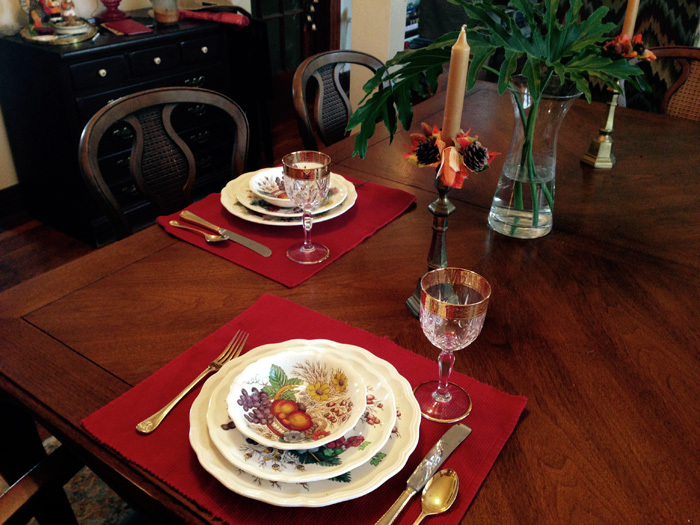 Anyway, it has been very helpful this week that Mama sent me pictures of her lovely tablescape. 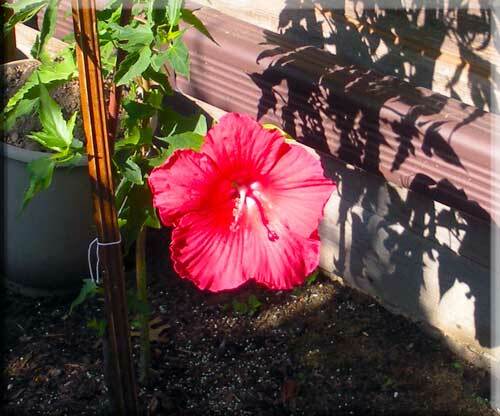 She also included some pictures of her beautiful fuchsia pink hibiscus. I love how the color radiates from the center that looks almost white to the edges that look almost red. Beautiful! The original recipe calls for cilantro instead of parsley and also includes a can of rinsed black beans. 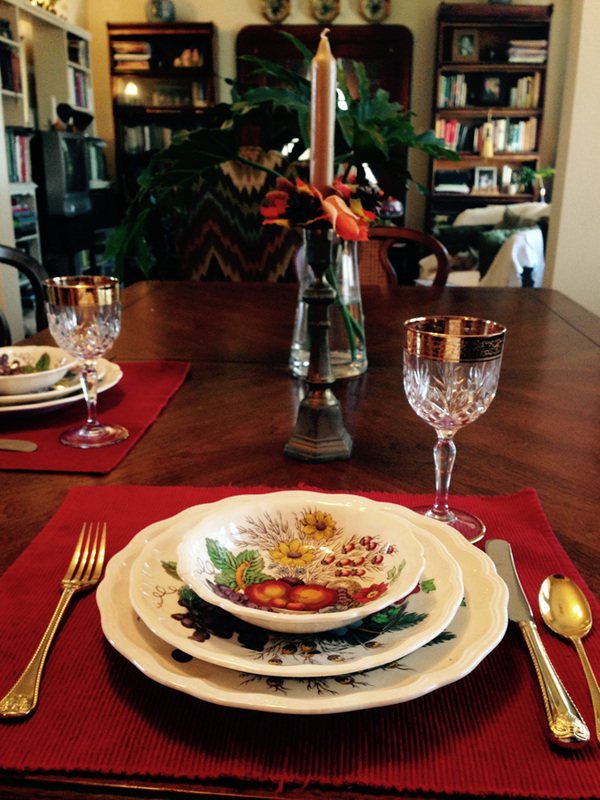 I switched this recipe up for my personal taste – you can too! Heat oil in a large nonstick skillet over medium-high heat. Add onions and garlic; sauté 1 minute. Add okra; sauté 3 minutes. Reduce heat to medium. Add bell pepper and jalapeño; cook 5 minutes. Add corn; cook 5 minutes. Stir in parsley; sprinkle with salt and black pepper. What a wonderful weekend we have had, celebrating our nation’s independence. We definitely need have some people to thank for our continued freedoms and that would be our military! Thank you, thank you, thank you. Met Monday with Susan at Between Naps on the Porch. 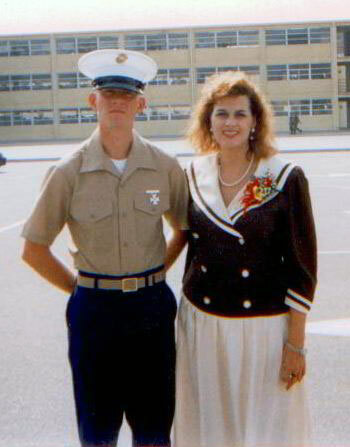 Pic of Bryan with me when he graduated from Marine boot camp (1996). Today, I want to introduce you to my nephew, Bryan. Bryan is a Marine. He is not actively serving, but, I learned early on, “once a Marine, always a Marine.” The metamorphosis here is what happened to him at boot camp. They took a bright, energetic, clever boy and made him into a bright, energetic, clever man. My sister, Tammy (his mother), and I went to his boot camp graduation. It was a life changing experience for me. We met with the drill instructors first. They spoke well of my nephew, which was a good thing. My sister and I were ready to take on the entire Marine force, if, for any reason, they didn’t have good things to say about him (which was unlikely). Luckily for us and for them, the drill instructors had nothing but good to say about him. It was a goose bump moment when we heard the cadence from the young men as they marched towards us in the dark. You could hear them coming from a distance. Once they arrived, they stood at attention until they were dismissed to find their families. That was an awesome time. We saw him go in as as a young man and he came out a Marine! The day he graduated from boot camp, I asked him what he had for breakfast. He said duck. I was surprised and said, “duck?” He told me that they had duck a lot. He told me that you duck your head and eat as much as you can before they kick you out. Never heard of that “duck” recipe before! I am so proud of my nephew, then, and now. After boot camp, he was assigned to the presidential guard. He served in Washington D. C. and then at Camp David. He served in Kuwait during the initial invasion of Iraq. He is no longer actively serving in the Marines but he still has that Marine attitude. He is a truly wonderful man that I am proud to have as my nephew. He is now married to a wonderful young lady and is still making me proud every day. I am truly blessed to have such a wonderful young man as my nephew, and, we as a nation, are blessed to have so many like him who serve our nation so we can sleep in peace at night when we lay down our heads. Thanks Bryan and to all of the other Marines for all they have done and continue to do for our country! My nephew has become quite the connoisseur. He makes his own fine wine and is quite an accomplished cook. On one of our trips together, he ordered mussels. He loved them. Here is a recipe that I’m sure he would love. Rinse the mussels under cold running water while scrubbing with a vegetable brush. Remove the stringy mussel beards as you wash them. Discard any mussels with broken shells. Heat 1 tablespoon olive oil and 1 tablespoon butter in a large pot over medium heat. Add the leeks, garlic, and thyme and cook until the vegetables cook down, about 5 minutes. Add the mussels and give everything a good toss. Add the white wine. Cover and steam over medium-high heat for 10 minutes, until the mussels open. Stir occasionally so that all the mussels are in contact with the heat. Add the remaining 2 tablespoons butter and a drizzle of olive oil to the sauce remaining in the pot and stir to incorporate. Season with salt and pepper. Sprinkle with the parsley. Serve with hot crusty French bread. Happy Father’s Day to all the dads out there! You have seen my favorite post for today many times. I was thinking this past week that I need to write another “Daddy-isms” post. My dad had a lot of great things to say that have stuck with this daughter even now, nearly 18 years after he died. This has been going through my mind this week as I watch the tragedy of the oil spill on the Gulf Coast and after our local community lost a wonderful lady who was a leader and who gave very generously of her time and talent. It is true, lost lives and a lost way of life can’t be recovered by any amount of money. Money problems are tough, no doubt about it! But, life and health are very precious and are worth more than gold! Since I posted Mama-isms, one of my two beautiful sisters requested that I give equal time to Daddy-isms. My Daddy died in 1992 at the age of 54 of cancer. 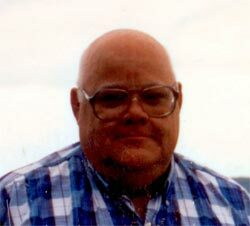 Daddy was a big, lovable man, full of integrity and loved by all who knew him. He laughed a lot and smiled a lot and I am very blessed to have had such a great Daddy. He was a very optimistic and positive man who had sayings that deserve equal time as well as a few funny memories. You can’t go through life looking in the rear-view mirror. About anyone who was a good cook – You’re a good cooker. About Marriage – Love is important but commitment is equally important. The Bible is a book that is meant to be understood by reading. When we were kids, my younger sister had a slumber party on March 31st one year. The following morning, my Daddy woke all of the sleeping girls and told them to be calm but to hurry outside because the house was on fire. When they were all safely outside he called to them from the door “April Fools.” He loved to pull April Fools jokes but that was one of the best. Daddy loved to swim and he made sure we all had swimming lessons. He would take us to the pool and delight us by throwing us high in the air. We would wear him out by begging him to throw us again. If we didn’t wake up after the singing, he would stand at the end of the bed and say chop, chop, chop (as he was falling forward) to give us time to get up before he said TIMBER and fell on top of us. To my recollection, he never actually fell on top of any of us. I could go on and on. As you can see, Daddy was a fun guy. I spent the afternoon yesterday with my friend Darlene planning our upcoming Mardi Gras party and it put me in mind of something with a little New Orleans’ Flavor. This is copied from Chef John Folse & Company Website. If you don’t have the River Road Cookbooks, look for them, they are great. This traditional Louisiana recipe was first presented in River Road’s cookbook from the Junior League of Baton Rouge. It is safe to say that this single recipe made the book world famous. In the late 1990s, Kraft foods did away with their jalapeño cheese roll which was originally used in the recipe. Recently, an alert customer informed us that Kraft’s Velveeta line introduced a similar Mexican cheese. Cook spinach according to directions on package. Drain and reserve liquid. In a medium saucepan, melt butter over low heat. Add flour, stirring until blended and smooth, but not brown. Add onions and sauté 3-5 minutes or until wilted. Add evaporated milk, spinach liquor and Worcestershire sauce slowly, stirring constantly to avoid lumps. Cook mixture until smooth and thick, stirring constantly. Add seasonings and cubed cheese. Stir until melted and combine with cooked spinach. This may be served immediately or put into a casserole and topped with buttered bread crumbs. The flavor is improved if the latter is done and kept in refrigerator overnight. This traditional dish can be spruced up for the holidays by adding ¼ cup diced red bell peppers when the onions are sautéed. Back in the late 80’s my little sister got married. Before her wedding, my Grandpa’s wife, Betty, hosted a beautiful bridesmaid luncheon in their home. Betty is a wonderful person and a most gracious hostess. 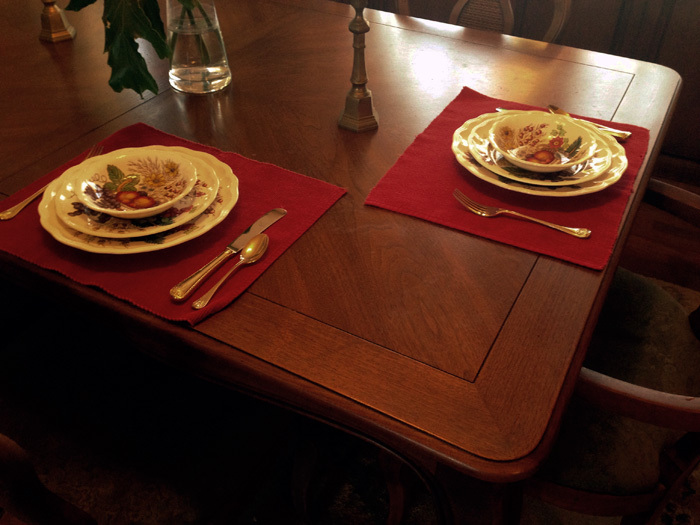 For this luncheon, she served this unbelievably delicious chicken dish. Recently, I asked my sister if she still had the recipe. She told me she had made it many times and she sent it to me with her notes. This is a really good recipe if you are cooking for a luncheon. 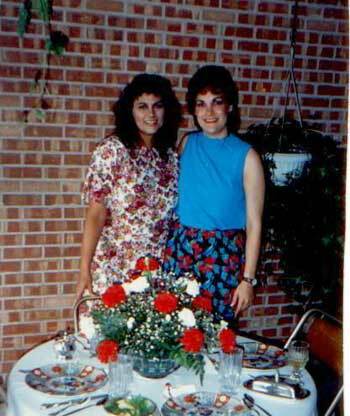 Here are some pics from the shower (remember, this was around 20 years ago!). How do you love the big hair?! Alright, I’m outa here. Headin’ to Vicksburg, Mississippi this weekend. My husband attended All Saint’s Episcopal School there and we are going to meet with some people about a reunion planned for the fall. Happy Weekend everyone! Want to find some great recipes? Head on over to Foodie Friday with Designs by Gollum! 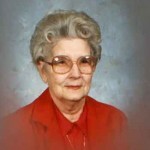 My sister, Linda also sent me the recipe for this casserole that she says is wonderful. Haven’t had a chance to make it yet, but, trust me, if she says it is good, it is! This is the 5th of the 10 Commandments. It has been said that the fifth commandment is pivotal, for it is between the commandments teaching us to love our Creator, and those admonishing us to love our fellow man. 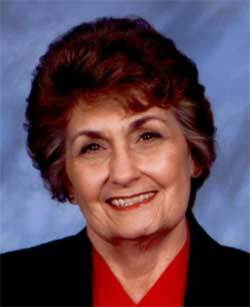 I have been blessed to have a wonderful mother! Love you Mama and Happy Mother’s Day! 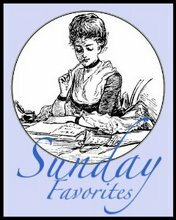 Today’s Sunday Favorite is a post that Mama did about her memories of the porch. 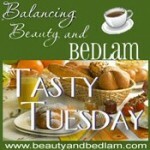 Here is another great “guest” post from Mama. 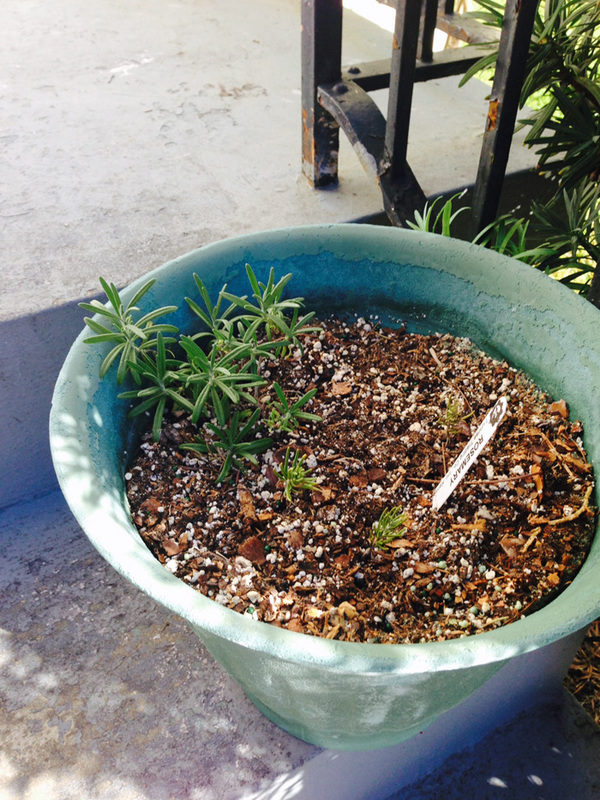 Today, she tells us about her memories of the porch. After reading all the comments about porches it brought back memories of my childhood. 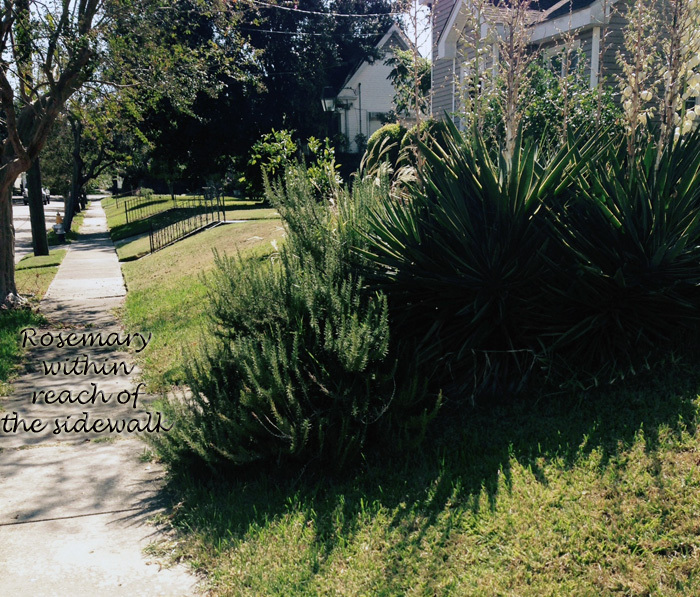 We had a big cement front porch, a porch swing and two views of the two streets since we lived on a corner. Many summer mornings and afternoons my friends from the neighborhood would come and play jacks on the porch, swing on the swing, play house or whatever. We would sometimes play cowboys, annie over, rover rover, swinging beauty, or maybe just go to the library and check out books,ride bikes or skate up and down the sidewalk but we would eventually end up on the porch resting and planning what to do next. 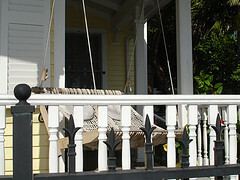 When I reached my teens the porch was a “meeting place” for boyfriends to sit in the swing or on the steps with me. We were, of course, under the watchful eye of my parents who were in the living room with the windows open, and could(and often did) appear at any moment to join us. I had many a goodnight kiss on the front porch. I now have a screened-in porch which we enjoy immensely. Two of our granddaughters love to come and swing on the glider and play and of course the backyard is just outside the screen door so it is like being outside but protected from the wind, bugs, sun, etc. 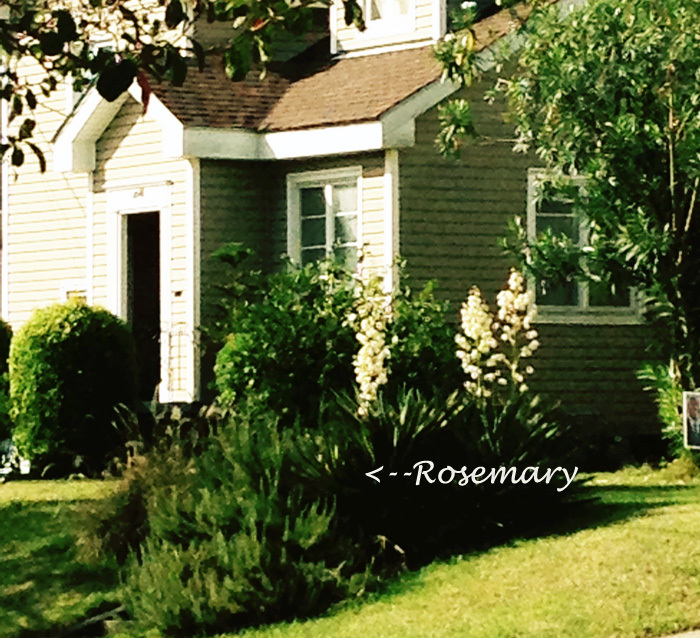 It seems sad to see so many homes with closed doors, no porches and many times no communication with neighbors. How can we ever get any problems solved, without porches? In the South when you order tea, it is either sweet or unsweet. Southerners love sweet tea. Here is a recipe to make your sweet tea to drink with a friend on the porch. 4 Quart size tea bags. Pour up into gallon jug or container. Fill the rest with cool water. It is Sunday so that means a past favorite and something for the soul. I’m very blessed to have a talented, creative, Christian mother. 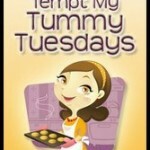 Last March, she wrote a guest post telling about how she got a great recipe for poppy seed rolls. If you would like the poppy seed roll recipe, it was from an earlier post, HERE. My husband, Chester and I were in Monticello, Utah last September doing a revival for a church there. The Pastor’s wife invited us for dinner one night before church. The meal was delicious but when she set the bread on the table, I thought it looked soooo good, I was sure it was dessert. Well, of course, it wasn’t but it looked so pretty and tasted so good it could have been. She also served some of her home canned apricot jam with it. Well, I could have skipped church that night because I thought I had died and gone to heaven already. It had been at least 30 years since I had ridden an ATV and my husband had never ridden one. So, we purchased some sweat suits at Alco, layered our clothes, starting with our pajamas, and put on the warmest clothes we could put together and met our guide at 7:30 one morning. After a brief overview of how to operate the machines we took off. Everything went great until our guide took off on what he called a trail, with lots of deep ruts, sheer drop-offs, low hanging tree branches and I don’t know what all. But, we kept up with him and it was fun. We had reached about 10,000 ft.when the trail (if you can call it that) became more of challenge. I was riding behind the guide and in front of Chester when I came to some ruts. The left wheels of the ATV kinda slipped into the ruts and began to “fall” over and . . . I began to pray! ” Lord don’t let this thing fall on me!” I was yelling “Help!” but no one could hear me for the noise the ATV’s make. Chester could see something was happening to me and the guide stopped and looked back and later said that I just didn’t look right. Well of course I didn’t look right, I was slipping off the ATV! Pour hot mixture into hot sterilized jars, leaving 1/4 in head space. Remove air bubbles; wipe jar rims. Cover at once with metal lids and screw on bands. Process in boiling-water bath 20 minutes. Remove jars from hot water carefully and place on cloth to cool. When the jars are cool enough to handle move to a cool place and let set for 1 month before opening. Yield about 10 pints. Today, is my wonderful Grandpa’s 94th birthday! I wrote this post last year for his birthday. What a wonderful blessing to have such a wonderful man in my life! Grandpa has lived quite a life. Sadly, he has seen the loss of his oldest son, my father and two of his grandsons, my brother and my cousin. But, he is a very resilient man who loves his family and always has a wonderful positive attitude. I am He who will sustain you. My Grandpa will be 93 tomorrow. I wish everybody could have a Grandpa like mine. Grandpa has always lived his life with a passion. Whenever I think about Grandpa, I think of him with a smile on his face. He has the best stories of anyone I’ve ever known and his life would make a great movie. From Grandpa, I learned a great work ethic. When I was in high school, I worked for him in one of his businesses and I remember being 7 minutes late one morning. He told me if I was ever late again he would fire me. I learned at a young age the value of being on time. Grandpa has always been so full of life. He always worked hard and played hard. He loves fishing. He used to go fishing in Canada and Mexico a lot and has wonderful stories from those times. He always has the most beautiful lawn around and he is an expert on growing green lush grass. He used get the Wall Street Journal. I remember, he would give his old copies to me. He told me three columns to read so that I could carry on an interesting conversation with anyone. Happy Birthday Grandpa! I love you. This is one of Grandpa’s favorites. It was also a favorite of my Daddy’s. Grandmother Dicus and Mama used Miracle Whip instead of mayonnaise for this recipe but you could use either one. Mix together sugar and miracle whip. Add soda and cocoa to warm water and then to stir it into the sugar mixture with vanilla. Bake 325 for 20 to 30 minutes in a 9 x 13 pan. Let cake cool then spread with chocolate fudge frosting. Place pecan halves all over the top of the cake. In small saucepan over low heat, melt butter; add cocoa, stirring constantly until smooth and slightly thickened. Remove from heat, set aside to cool slightly. In large mixer bowl combine sugar and milk, beat until smooth. Add chocolate mixture and vanilla. Beat on medium speed until smooth and slightly thickened, 5 to 10 minutes. Cool at room temperature to spreading consistency, about 1/2 hour. Today, January 3rd would have been my daddy’s 72nd birthday. Many of you who have read my blog know that my daddy died at the age of 54 of cancer. I wrote this article last January about him and it will always remain one of my favorites. Just before daddy turned 50, he and my mom sold everything they had and moved from the small town, where they both grew up and raised their family, to Fort Worth, Texas where my dad entered the Southwestern Baptist Theological Seminary. My husband and I and our little dog and cat have been traveling the last few days. We spent a couple of days with my mother and her wonderful husband in Oklahoma. The day after we arrived, a blizzard blew in! 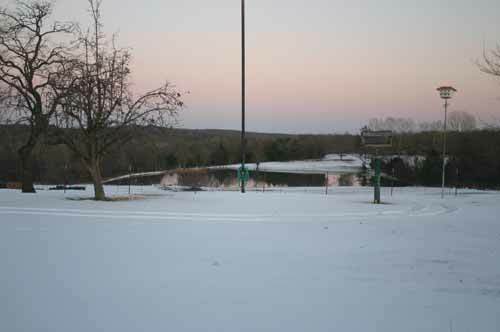 It made for a beautiful white Christmas, but unfortunately, many people were sliding off roadways and involved in accidents. 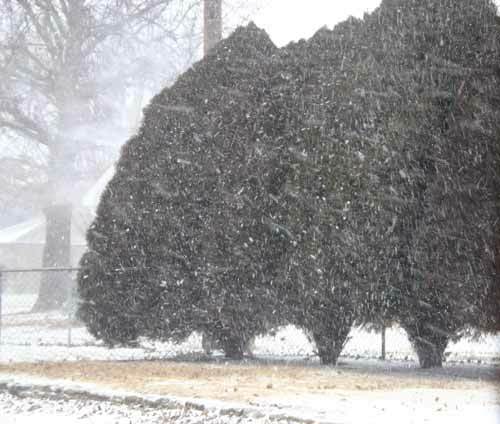 According to the radio, this was the first blizzard in Oklahoma in 25 years. It started with icy sleet and then was followed by snow. We stayed in and had a wonderful time and sent up many prayers for those who were not home safe and sound. The day after Christmas, we headed to my Grandpa’s house. Grandpa will be 94 in January and his beautiful wife, Betty turned 84 the day before Christmas. Grandpa’s home is in a beautiful area and he has a lovely pond where the geese land and put on a show. He made two bird feeders that hold 50 lbs. 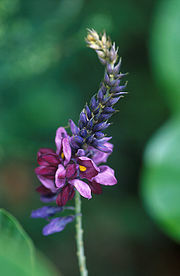 of seed each. 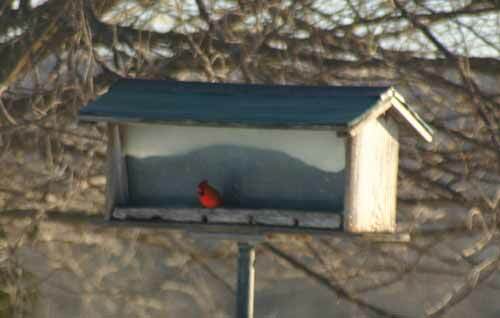 The cardinals around the bird feeders and were beautiful! The area behind the pond had gotten a little overgrown so one of Grandpa’s friends suggested that they get some goats to help clear the area out. Well . . . they did! They now have around 40 to 50 goats. It is hard to count them because they won’t stand still. Here is where the metamorphosis comes in, Susan. 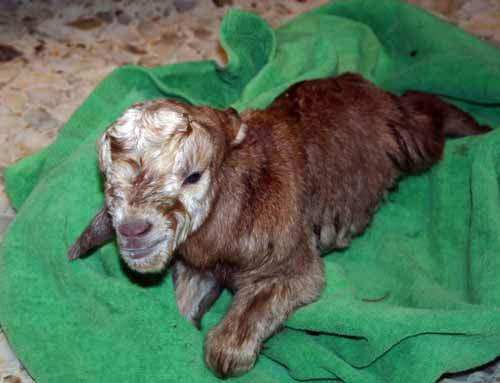 While we were there, the goats were delivering babies. Not just one or two but more like 8 or 9 (from different mothers). One of the sweet little babies was rejected by his mother. I’ll spare you the picture of the poor little thing laying in the hay outside the barn where she left him without cleaning him up. He was just laying there shivering and wet. 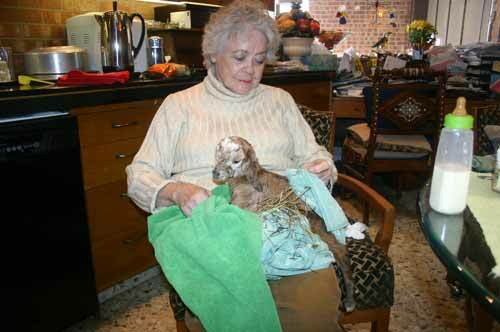 Betty getting ready to bottle feed the little boy goat. 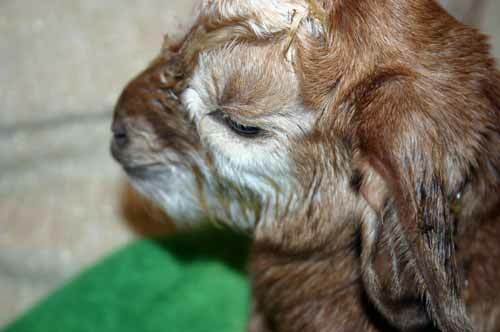 He is now doing well and should make it, but now Betty has to take over for the mother. She has done this before and still continues to feed a couple of the babies she had to take over. So, that was my adventure with the goats! It was a lot of fun. 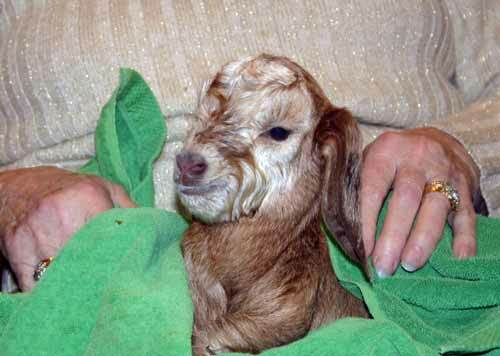 My husband insisted that I could not bring a goat home! You knew I had to get a goat product in here 🙂 This one is from Ina Garten. Slice the Montrachet into 12 (1/2-inch-thick) slices. (The easiest way to slice goat cheese is to use a length of dental floss.) Dip each slice into the beaten egg whites, then the bread crumbs, being sure the cheese is thoroughly coated. Place the slices on a rack and chill them for at least 15 minutes. For the dressing, place the vinegars, sugar, salt, pepper, and egg yolk in the bowl of a food processor fitted with a steel blade and blend for 1 minute. With the motor running, slowly pour the olive oil through the feed tube until the vinaigrette is thickened. Season, to taste. Toss the salad greens with enough dressing to moisten, then divide them among 6 plates. Melt 1 tablespoon oil and 1 tablespoon butter in a saute pan over medium-high heat until just under smoking. Cook the goat cheese rounds quickly on both sides until browned on the outside but not melted inside. Top each salad with 2 warm rounds and serve.